Perimenopause is a time in a woman's life where she may begin to gain more weight than ever before. Both age and the transition of menopause work together to affect a woman's weight at this point in her life. While it can be frustrating, there are a number of ways to begin to lose that weight. 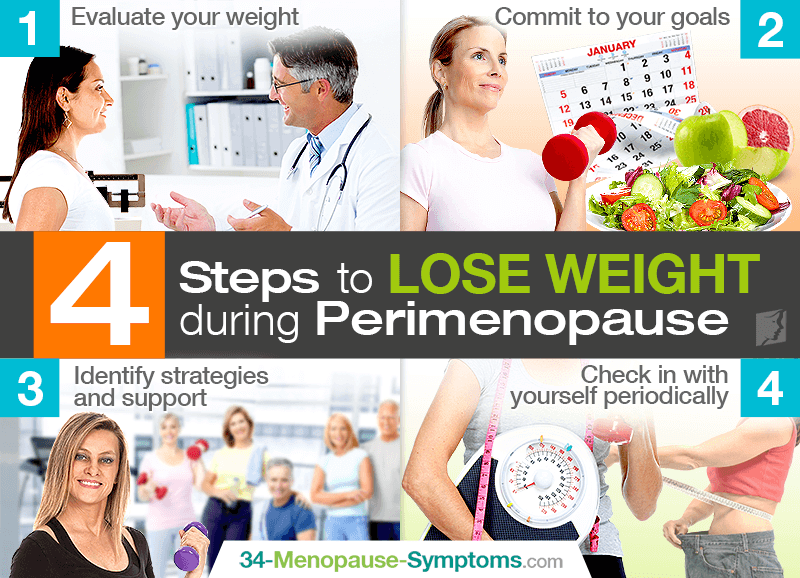 Read on to learn about the steps to lose weight during perimenopause. The first step is to decide if you need to lose weight at all. Our culture can sometimes convince us that our bodies need changing even when they don't. It can be useful during this step to talk to a doctor or other health care provider for insight on what a healthy weight is likely to be for you. Some women may not progress beyond this step because their weight is within a healthy range, but for those that need to lose some weight, this is the time to set specific goals. Next, you need to decide how much weight you want to lose, and in how much time you plan to achieve this weight loss. This is your biggest, overall goal, but it is a good idea to set smaller goals along the way. Plan to have a certain amount of weight lost by a certain time, for instance. Keep in mind that your goals should be specific, realistic, and forgiving. Setting a goal you can't reach is certain to lead to failure. Also, remember that many people experience setbacks every once in a while, so be prepared to forgive yourself for a slip and to keep moving forward rather than giving up entirely. It is important to figure out the ways you plan on losing weight. While all the most effective weight loss plans focus on both diet and exercise, people may place different emphasis on different factors. You can try out different types of exercises to decide what you like best, or investigate new healthy recipes. You can even look into weight loss programs. Also look for people and groups that can help to support you during your weight loss process. Studies have shown that people who spend time with friends who exercise and eat healthier are themselves more likely to exercise and eat healthy foods. Additionally, having support can help you during a setback. Be sure to pay attention to how well you're meeting your goals. If you're struggling with something, think about changing it to make it something you can achieve - you should always start small and work up to the biggest changes. If you're making the progress you want, don't forget to reward yourself! Rewards that involve food are usually a bad idea, but you can splurge on a new outfit or gadget that you've been wanting for a while. With these four steps to lose weight, you'll be able to keep off the extra pounds as your body transitions during menopause. To learn more about weight loss, read about the best ways to lose weight without dieting. Discover where those extra pounds come from during menopause, and discover lifestyle and diets tips ideal for losing weight, and keeping it that way. Weight gain does not have to be an inevitable or permanent part of aging. Click here to learn how to lose weight and live healthily in postmenopause.